RainCity Housing is initiating a public consultation process to gain input into the design and development concepts for the shelter/transitional housing facility at 3030 Gordon Ave. To this end, RainCity is hosting an open house on Tuesday, October 16th, 5 – 8 PM at the Evergreen Cultural Centre. 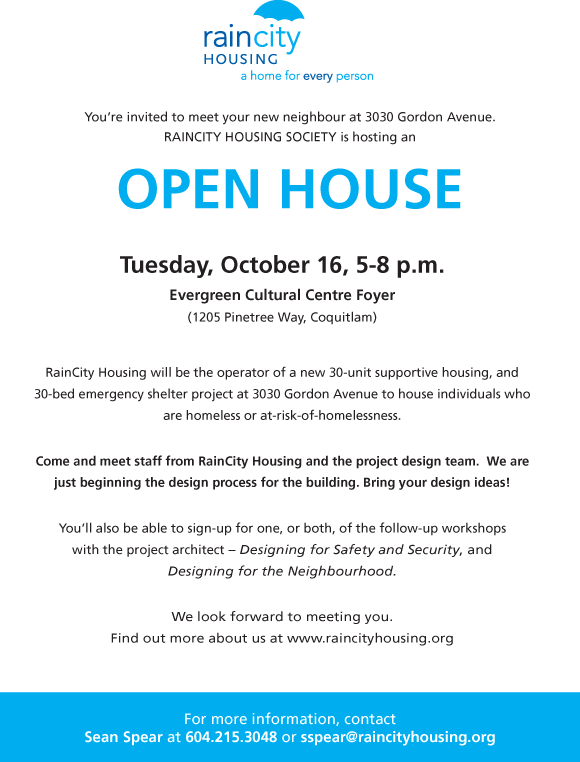 Come and meet staff from RainCity Housing and the project design team and provide your ideas for the design and layout of the facility. You’ll also be able to sign-up for one, or both, of the follow-up workshops with the project architect – Designing for Safety and Security, and Designing for the Neighbourhood. By tricitiestaskgroup in News on October 9, 2012 .